Social media celeb uses her image to cash in. There are few narratives in modern celebrity culture as unexpected as the ascent of the Kardashian-Jenner family. When they first appeared on America’s televisions in 2007 as the stars of E!’s reality series Keeping Up With the Kardashians, few could have guessed that within nine years, daughter Kim would become a massive, global celebrity; that patriarch (and former Olympian) Bruce would transition to Caitlyn; that matriarch Kris would sit atop a billion-dollar empire—or that the youngest daughter, Kylie, just 9 when the show launched, would find herself an online superstar, budding entrepreneur and millennial icon. Now 18, Jenner is the embodiment of an entirely new type of celebrity, one that didn’t exist only a few years ago. 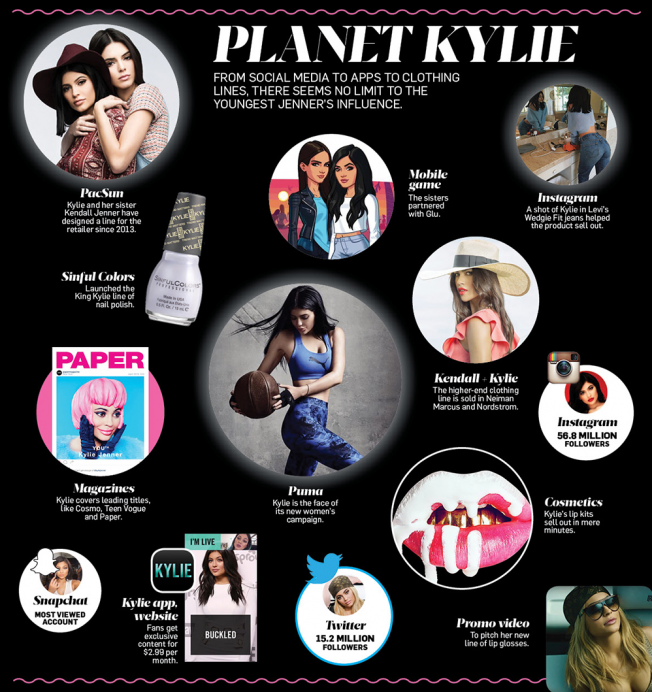 Her massive celebrity is not based in any type of legacy medium (although she appears on KUWTK, the show is far less essential to her than to her older sisters), any aspiration to be an entertainer (she has expressed little interest in acting, singing or hosting) or the creation of digital content (unlike major online celebs like PewDiePie and Bethany Mota, Jenner didn’t accrue her fan base via YouTube videos or blogs). Rather, her celebrity—and increasingly valuable brand—stems merely from the image she presents across social media. On Instagram, she has amassed more than 57 million followers, making her the seventh most-followed celebrity on the platform, between Justin Bieber and Cristiano Ronaldo. On any given day, she might post upwards of 10 photos of herself hanging out with friends and family, showing off a new pair of shoes or promoting a brand. On Snapchat, where Jenner became the most-followed celebrity last July, fans will find her lip-syncing to Kanye, J. Cole and Future while riding around in her Ferrari or Rolls-Royce; canoodling with her boyfriend, the rapper Tyga; and pouting at the camera. The best content is reserved for the official Kylie Jenner app, where fans spend $2.99 per month for access to exclusive articles and videos of Jenner giving beauty tips or taking viewers on a tour of her home. While that may not sound like groundbreaking stuff to older generations, it’s obsession-worthy for Jenner’s massive audience of millennials and teens. Her every move is closely watched and emulated—trends from matte lipstick to “athleisure” apparel can be traced back to Jenner—while products featured on her Instagram feed, whether it’s a pair of Levi’s new “Wedgie Fit” jeans or her own cosmetics, invariably sell out. Finally, there’s her unconventional style. While adults might raise an eyebrow at Jenner’s signature look—plumped-up lips, heavy makeup, a constantly changing rainbow of hair colors—younger fans, many of whom are still experimenting with their own appearance, applaud her unapologetic self-expression. “She marches to her own drumbeat and millennials love her for it,” says Jeetendr Sehdev, celebrity branding expert and USC marketing professor. In a survey of 3,000 adults ages 18 and older conducted by Sehdev, Jenner ranked 62 percent higher than traditional Hollywood celebrities in terms of distinctiveness, which “in itself is an enormous opportunity for brands that want to be able to stand out from the crowd,” he adds. Brands are certainly paying attention. While Jenner is no stranger to endorsement deals—at age 11, she made a reported $100,000 from a line of Kardashian-themed nail polishes, and with her sister Kendall Jenner has designed fashion lines for PacSun, Steve Madden and Topshop—her value as a solo act is skyrocketing. In the past year, she became a brand ambassador for skin care line Nip + Fab, launched the King Kylie collection of nail polish with Sinful Colors, and this past February, made headlines as the face of Puma’s latest women’s campaign. With high-profile partnerships under her belt, Jenner is now venturing out on her own as an entrepreneur. 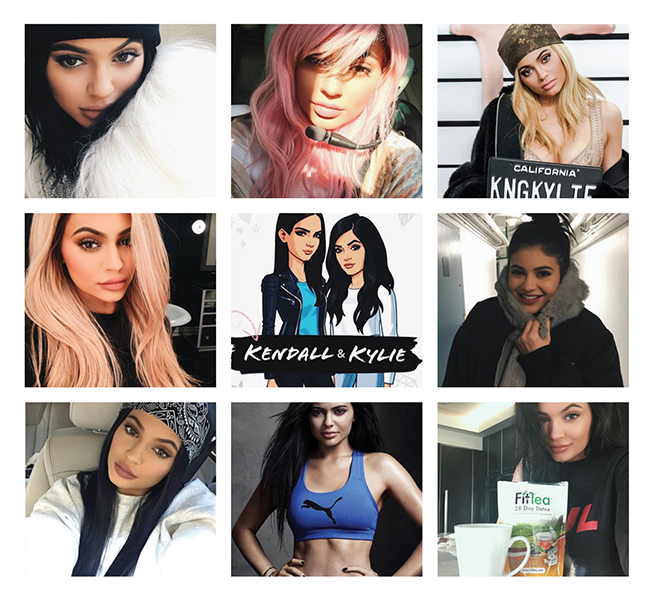 In February, the Jenner sisters launched their own apparel and accessories brand, Kendall + Kylie. Their first independent collection, it features a more grown-up but still teen-friendly take on their signature style. The collection, which debuted at this year’s New York Fashion Week, was quickly snapped up by top luxury retailers including Neiman Marcus, Nordstrom and Saks Fifth Avenue. Then, there’s Jenner’s beauty line, Kylie Cosmetics. Launched last year, the $29 liquid lipsticks and lip liner duos—dubbed Lip Kits—became a full-blown craze, selling out within minutes on Jenner’s own website. Fans took to stalking her social media accounts and app for hints on when orders would be restocked and spending hundreds of dollars to buy the kits on eBay. Last month, Jenner added glosses (which also sold out immediately), and she has hinted that new products are in the works.